At The Meadows, we are very proud of our facility and the amenities that we provide. Our facility is both functional and beautiful to ride in. Considerable time and thought went into the design and construction of the entire facility. No detail has been overlooked. We carefully selected the best in modern features with both our riders and their horses in mind. The stable is equipped with a 24’ x 24’ large heated tack room with 30 private lockers most equipped with double saddle racks. Our lockable tack boxes are floor-to-ceiling with tons of storage for all your equipment. 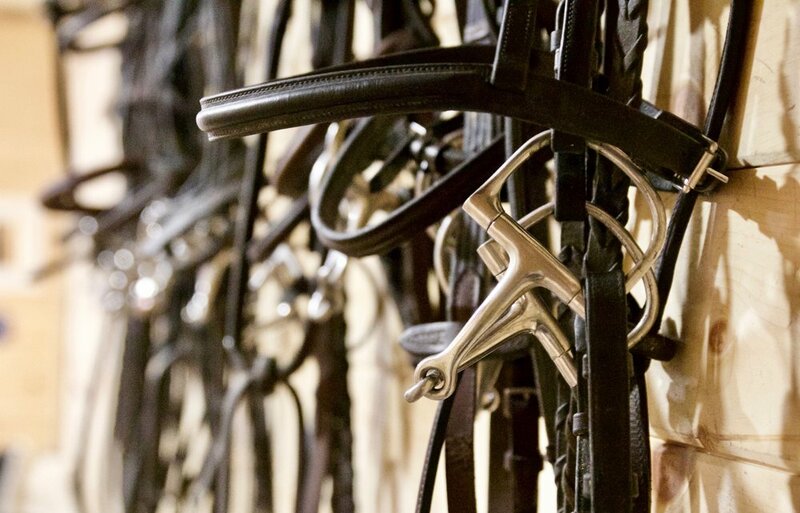 The tack room has a separate equipment wash station and a viewing area looking into the arena. There are separate commercial grade laundry facilities, and a heated washroom on the lower level. We know what it is like to be a supporting parent or sibling to a rider. Cold winter or humid summer nights in a stable can be really unpleasant. We have designed a heated and air-conditioned viewing room with TV, wi-fi, kitchenette and washroom for your comfort and convenience. Come join us inside and enjoy watching our riders! Viewing outside…. Come join us at our shaded Cabana by the outdoor ring and enjoy spring/summer/fall viewing in comfort. Fresh water 24/7 year-round & green grass. Our property has large grass paddocks for daily individual and group turnout. We have fresh, year-round water supply to every paddock through a new Nelsen automatic hydrant system. Paddocks are seeded with pasture mix to allow for a consistent supply of green grass throughout the season. Management employs a paddock rotation system to ensure optimal grazing opportunities for all areas. The property has brand new three-board fencing and safe gateways. The entire property is completely secure and there is no access for horses to the main driveway and roads. There is ample tracking with lovely scenery. Our new 180’ x 80’ insulated arena has large, bright windows that open for natural light and air circulation during the day to make riding comfortable. The arena has 40 new T5 custom light fixtures that turn on right away - no waiting for lights to warm up and absolutely no spooky shadow corners! Best of all, it's insulated and warm in the winter, cool in the summer. Having great footing under you is important to the health of your horse and to your safety. The Meadows is pleased to have installed in the arena state of the art European style shock absorbent, non-slip TravelRight footing that is dust-free and provides a clean environment for the rider and a shock absorbent base for horses. Our outdoor ring is located at the back of the property away from high traffic areas and surrounded by paddocks and trees. The large 140’ x 240’ space allows for multiple horses to work freely and at the same time in a controlled environment. We installed underground drainage, automatic irrigation systems and customized fibre-based, shock-free, dust-free footing to ensure a comfortable and safe ride. The ring has a convenient and shaded viewing Cabana and numerous types of jumps to optimize the riding experience. Our new dust-free barn was built in 2013. The barn is designed with extra ceiling height, wide aisles, superior T8 lighting and windows throughout the barn to provide lots of natural light. Extra-wide hallways help ensure riders and horses are never crowded out and have enough space for easy maneuverability. The barn and arena are built side-by-side with double hallway access so that once you are tacked up, it is a short indoor walk to the arena. We have 34 large stalls with extra-tall ceilings and large windows in all exterior stalls for lots of natural light. All the box stalls are large (12’ x 12’) with individual windows and/or view through front to allow horses to see their environment. We have a generous matted base in all stalls. All stalls are sanitized daily to ensure a healthy, infection-free facility. There are individual water buckets in each stall with an easy pour water system to allow for individual monitoring of water intake. All water buckets are cleaned daily. There are two inside wash stalls and two exterior wash stalls equipped with a temperature controlled water supply and heating system for winter bathing. We provide a safe and secure environment to enjoy riding. The Meadows' property has security cameras covering all public areas of the facility. We have a fire rated protection system, alarms and 24/7 staff surveillance. These features are all designed to ensure the safety of all the horses and the security of all riders and their equipment.